Cristiano Ronaldo netted his 19th league goal of the season against Frosinone and is now only behind Lionel Messi in the race for the European Golden Shoe. Juventus stretched their lead to 14 points at the top of the Serie A table, as they beat Frosinone 3-0 in their league game at the Allianz Stadium. The Turin-based team started the game well as Paulo Dybala scored a screamer to give them an early lead in the sixth minute of the game. Leanardo Bonnuci increased the Fidanzata d'italia's advantage to two goals in the 17th minute before Cristiano Ronaldo put the game to bed by finding the net during the 63rd-minute of the game. Juventus are the only unbeaten team in Europe's 'top-5' leagues this season and have won 21 of their 24 league games thus far this campaign. 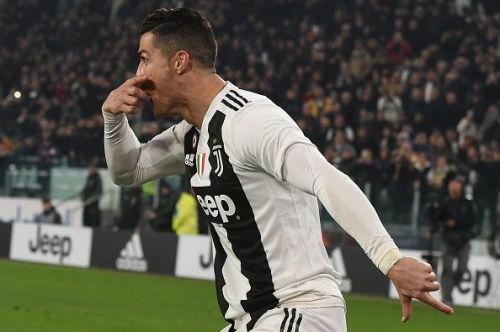 Cristiano Ronaldo continues his impressive goalscoring run for Juventus, as he scored his 19th league goal of the season in the Zebre's 3-0 victory over Frosinone at the Allianz Stadium. Lionel Messi(21 goals) is currently the front runner for the European Golden Shoe this season but is now just two goals ahead of the Portuguese star. Cristiano Ronaldo is in great form since joining Juventus from Real Madrid last season and is currently the leading goalscorer(19 goals) in the Serie A. He won the European Golden Shoe four times in the past and will be looking forward to winning it for the first time with Juventus this season. Juventus will play Atletico Madrid in the first leg of the Champions League round of 16 tie before making a trip to Emilia-Romagna to play Bologna FC in the league on February 24.